Friday 20th June was an extremely important meeting for our Club where the incoming President and his team set out their plans for the year ahead. 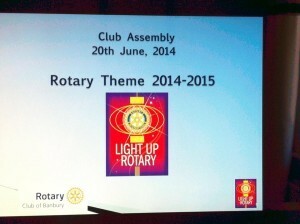 President Elect Phil welcomed Assistant District Governor Keith Crawford and presented R.I. President in 2014/15 Gary Huang’s theme for the year – “Light up Rotary”. Phil is seeking members’ views on how in our Club we can “Lighten up Rotary”, have fun, and make it appeal to local communities. Phil introduced his team for the year, and outlined a SWOT analyses that he and the 1st Vice President elect had produced, and then asked the Committee Chairmen to outline their plans for the year. Phil then outlined the District Citation requirements for the coming year and our plans to meet, if not exceed, them. President’s remarks: Phil gave a comprehensive PowerPoint-supported preview of the year ahead. 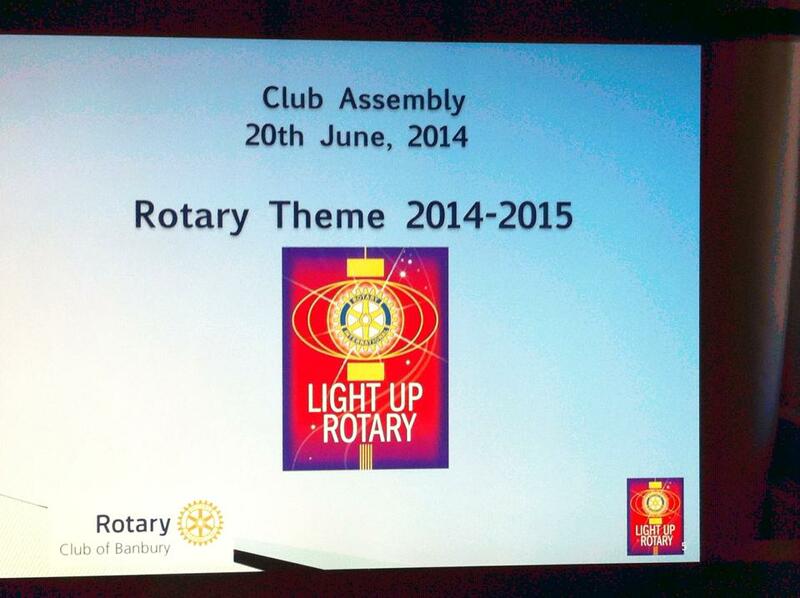 He introduced the “Light(en) up Rotary” theme. The Club has published a program of major events for the year over which Phil has worked with his two successors to ensure that the program is sustainable. They have also done a SWOT analysis showing that the club has considerable strengths. The only causes for concern are internal communications, public awareness, and member participation (particularly with older members fading). Phil is taking the District Citation seriously and has already thought how they can meet the criteria. Phil then handed over to committee chairs to outline their programs. Community/Vocational (Chair: Simon Bion) Their Christmas street organ collection will be extended to 5 days, and other activities will be broadly as before. They are keen to support other community organisations both with manpower and with financial support for specific local needs. Their preferred projects will be Alan W’s Waterloo School and Lunge Community Clinic. Banbury will continue their exemplary support of APF and polio, and hope to pursue both district and global grants. Youth Service (Ian Calderbank substituting for Geoff Pollard): They will carry out their usual extensive range of youth activities (Young Chef, Children singing for Children, Practice Interviews etc) and will mark the 25th anniversary of their Young Musician competition with a special concert. Membership (John Smith): They aim to increase their membership by 5% i.e. 3.7 members, which they will round up to 4. Two members, Charles Swain and Roger May were voted for promotion to Honorary Members on health/age grounds. MPRC: (Chair: Bernard Goodchild). They will set up a new website and promote their presence on social media. Next Its been a Good One John!